Revs. Leonardo and Cleivy Garcia serving communion at the Quessua United Methodist Church. It’s been a while since I last posted news about our missionaries Leonardo and Cleivy Garcia, serving in Angola. So much has happened in the last few months in their lives, a mixture of successes and difficult challenges, but in all God continues to glorify His name through their ministry. 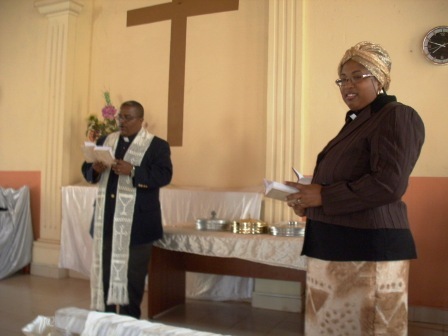 At the Annual Conference event of the East Angola Conference of the UMC last February, Leonardo and Cleivy were appointed as pastors of the Quessua UMC and re-appointed as directors of the Orphanage. Cleivy was also appointed as vice-dean of the School of Theology. Because of their responsibilities with the Quessua educational initiative, they have been invited as regular participants of a weekly Christian radio program that covers the province of Malange. In March, Cleivy had a medical emergency when she got sick overnight. For two days, there was no way to take her to the city hospital. Leonardo made it to the city on his own and got supplies to put her on IV’s. The incident led us to realize that the need for a car was too critical to be ignored. 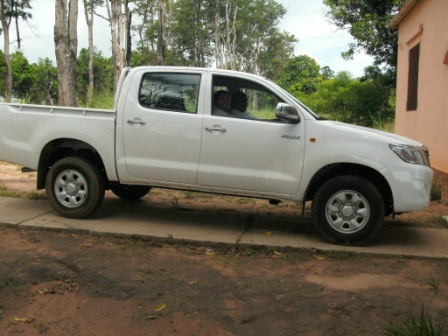 In order to empower the Garcia’s ministry in Quessua and save lives, the East Angola/Florida Partnership incurred an unplanned debt of $35,000 for the purchase of a pick-up truck.This is a modest price by Angolan standards for a Toyota 4X4 diesel pick-up with a double cab. The Garcia's celebrate the arrival of the truck at the Quessua mission. Then on a May Monday morning, I received an unexpected call from Cleivy. Leo was going to be admitted to the ICU in the city hospital with a bad case of malaria. Under the careful watch of Dr. Laurinda, Bishop Quipungo’s wife, he was administered an aggressive and effective treatment. Ten days later, Leo was back on the field. The Garcia’s are counting on the prayers of covenant churches and friends in the Florida Conference to remain strong and healthy at all times. It is through our support that they receive encouragement: “Leo is so grateful for the great love God has shown him through the prayers of our brothers and sisters in Florida. Please, let them know how much we appreciate them,” Cleivy says. As I write this blog, the Garcia’s are getting ready to host the first mission team from the Florida Conference this year. The team, from Harvest UMC, will be making repairs to the parsonage of the Quessua church, where some of the orphans currently live. Leonardo has prepared a full schedule of activities for the team, including a VBS for the children in the community. They will also visit the picturesque Kalandula Falls. Working together and praying for one another in the power of the Spirit, the Garcia’s and their supporting friends in Florida continue to build the kingdom of God in Angola. You may send words of encouragement to the Garcia’s by posting a comment to this blog.